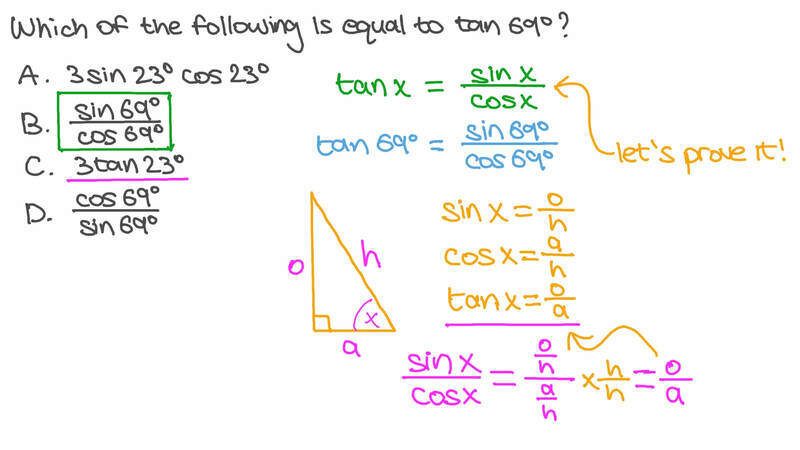 In this lesson, we will learn how to use the reciprocal to find trigonometric identities like the sine, cosine, and tangent functions and how to use quotient identities. Which of the following is equal to t a n 6 9 ∘ ? Find the value of 2 𝜃 𝜃 + 1 1 𝜃 𝜃 + 7 𝜃 𝜃 s i n c s c c o s s e c t a n c o t .
Which of the following is equivalent to s i n c o s 𝜃 𝜃 ? Find the value of t a n 𝜃 given 1 1 𝜃 − 1 3 𝜃 1 1 𝜃 + 1 3 𝜃 = 2 3 c o s s i n c o s s i n .
Which of the following expressions is equivalent to c s c 𝜃 ? Which of the following expressions is equivalent to s e c 𝜃 ? Which of the following expressions is equivalent to 1 𝜃 c s c ? Which of the following expressions is equivalent to 1 𝜃 c o t ? Which of the following expressions is equivalent to 1 𝜃 t a n ? Find s i n 𝐵 given t a n 𝐵 = 4 3 and c o s 𝐵 = 3 5 . Which of the following expressions is equivalent to c o t 𝜃 ? Find t a n 𝐴 given s i n 𝐴 = 0 . 5 and c o s 𝐴 = √ 3 2 .